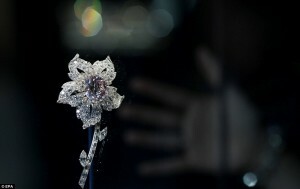 An exquisite collection, including the world’s biggest diamond, is currently on display to celebrate the Queen’s Diamond Jubilee. 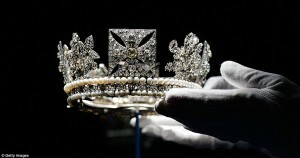 Since the end of June and up until the 7th of October, 10,000 diamonds from the Queen of England’s private collection will be on display at Buckingham Palace to celebrate the Queen’s Diamond Jubilee. These come in many different shapes and sizes and span six monarchs in three centuries. These include the tiny crown Queen Victoria won in the ‘modest’ days of her widowhood and the Diamond Diadem Tiara, which the Queen can be seen wearing on English and Commonwealth stamps as well as some coinage and bank notes. 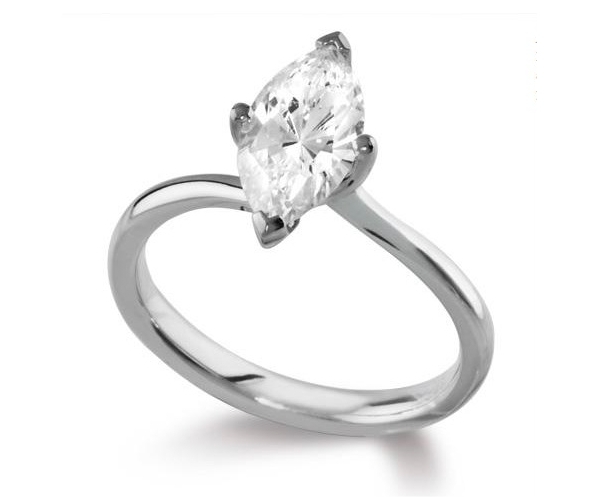 But perhaps the most impressive diamond on display is the Cullinan diamond. This is the largest rough-cut diamond ever found. It weighed an impressive 3,106.75 carats (or 621.35 g) when it was found in a mine in South Africa in 1905. It has since been ‘downsized’ into seven major stones and ninety-six minor ones. One of these, Cullinan I, is now the second biggest polished diamond in the world after the Golden Jubilee. It is now placed on the head of the Sceptre of the Cross. The Queen’s really knows how to celebrate her Jubilee! 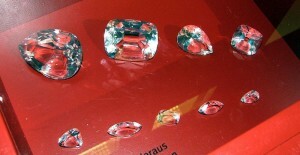 Some of the cuts from the Cullinan Diamond now on display to celebrate the Queen’s Diamond Jubilee. Image via Wikipedia. That said, our personal favourite of the collection is the Willamson brooch, set with a pink diamond. Said to be the most flawless diamond in the world, it was given uncut to Queen Elizabeth and Prince Andrew for their wedding in 1947 by Canadian geologist John Williamson. In 1952, it was cut and placed as the centre stone of a flower-shaped brooch with five white diamond-encrusted petals and a stalk with white baguette cut diamonds. The brooch was designed by Frederick Mew of Cartier no less. Wouldn’t mind getting that as a wedding gift! The stunning Williamson Pink Diamond Brooch, said to be the most flawless in the world. Currently on display for the Queen’s Diamond Jubilee. Image via The Daily Mail. So if you’re round London way before the 7th October, you should definitely consider paying a visit to the Diamond Jubilee exhibition. If you do, let us know what you thought of it on Facebook or Twitter. We can’t all have royal pay packets, but that doesn’t mean we can’t have something that will make us feel like we’re having our own Diamond Jubilee. What about this gorgeous MIMOSA Platinum marquise cut diamond solitaire engagement ring?